Total PDF Converter X is the right solution to convert PDF files to other formats on web-servers. Total PDF Converter X (SDK) is a PDF software development kit to convert PDF to DOC, RTF, XLS, HTML, EPS, PS, TXT, CSV or images (BMP, JPEG, GIF, WMF, EMF, PNG, TIFF) on web-servers. Use it to add the ability to convert PDF files into your own applications. Total PDF ConverterX (SDK) can be integrated into both server and desktop/client applications. 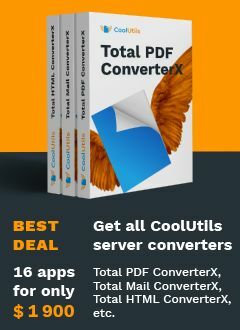 Buying Total PDF Converter development kit you get both command line tool and ActiveX. It has no GUI or any interrrupting messages. Total PDF ConverterX SDK can convert many PDF files at once, combining them into one resulting file or exporting each source to a new file. Users can select the paper orientation, quality and size of the produced image, choose fit to page oprion or select end page symbols to separate pdf pages in the text file. Total PDF ConverterX can easily export data from password protected documents too provided that you specify the password. More unique options.. Different settings are offered for each type of conversion. Total PDF ConverterX can process multi-page PDF files in 2 ways: either convert PDF into one target file or extract every page and convert them to the target format. The program can also combine several PDF files into one image. Using Total PDF ConverterX for enhancing your existing apps requires minimum efforts. All features are already implemented in the code, and you need only to pick necessary parts and paste them into your application code with slight adjustments. Hundreds of our clients successfully implemented PDF converting options to their applications. Get your copy now - both command line converter and ActiveX are included into the download. C.Convert "c:\source.PDF", "c:\dest.HTML", "-cHTML -log c:\pdf.log"
"Up to now, the tool is doing the job correctly, that is converting PDF files to Excel files using command line within a Windows scheduled task, if I would have any problem I will certainly contact you." "Thank you very much for all your help. The Total PDF ConverterX is working great. This was a much needed fix when one of your competitor's product would hang when ran from a Windows service. Your cooperation and prompt response has been a real life saver in allowing us to meet our customer's deadlines." Total PDF ConverterX is not limited to PDF. It also supports PS, EPS, PRN, OXPS, XPS documents. We add new formats once they are released. Want to get new files without images? Total PDF ConverterX can exclude images from the source PDF documents. Use Total PDF ConveterX as a PDF splitting utility. It cand extract all or selected pages from a multi-page PDF, split PDF by bookmarks and by blank pages fast. Total PDF ConverterX will change the date of the files or keep the original time stamps up to your choice. Sign PDF documents with your digital signature (add pfx file). Total PDF ConverterX can automatically rotate your documents. PDF to JPEG? Customize the final image to your needs. Set the desired quality of the JPEG image to compromize the file size. The app also extracts selected pages and converts them to JPEG. No time to figure out how it works? Make all the settings in GUI version and the app will produce a ready-to-use BAT file for you! Output file types include DOC, RTF, XLS, HTML, BMP, JPEG, GIF, WMF, EMF, PNG, EPS, PS, TIFF, TXT, CSV, and PDF! PDF to TIFF: the app can combine several PDF files into one TIFF image or place every page of a multi-page PDF into a new TIFF file. Need examples? We provide you with the fully-functional code in a variety of languages (ASP, PHP, C++, Pascal, VBScript). Save your time by integrating our straightforward API. Add text or image watermarks (file name, date confidential stamp, logo) to the header or the footer of the output file. Save your time by using a server-side process to convert PDFs to other file types. Total PDF ConverterX has been online since 2006! You can reply on it. We offer many types of licenses for server Total PDF ConverterX to suit every need. All of them are very affordable! Convert PDF on VB.net automatically. Need PDF conversion feature in your app? Get a royalty-free license. It allows you implement Total PDF ConverterX into your software and redistribute it. RFL is licensed per project (no matter how many developers are involved).